Researchers at UC Riverside have shown that a buffalograss cultivar can make a thick, green, drought-tolerant lawn for California's hot dry summers. We have partnered with Florasource, Ltd. to bring this alternative turfgrass option to the public. ‘UC Verde’ ® buffalograss may be mowed as a lawn or left long for a landscape meadow. 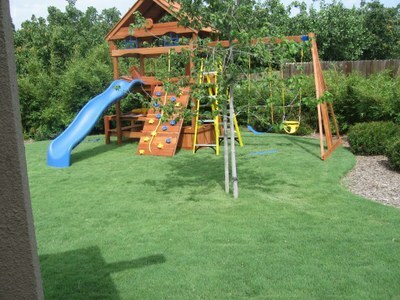 Unlike other lawns, this grass only requires weekly watering during the warm season to maintain its appearance. Its slow growth means mowing is required once every two to three weeks for lawns or once a year for a meadow, to invigorate growth. Environmental and health benefits of planting ‘UC Verde’ ® can be found here. 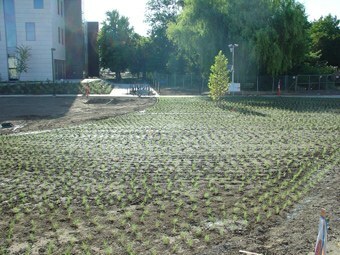 The new Graduate School of Management at UC Davis integrated UC Verde buffalograss into their landscape as part of their LEED Gold certification with the U.S. Green Building Council. Typical warm weather fill-in takes place in a matter of weeks.